Hunting for a place to have a hopping good time? Look no further than Happy Valley. On 17 April Happy Wednesday welcomes you to an Easter eggstravaganza. Gather your friends to witness the coming of spring while enjoying world class racing at its finest. Spring has sprung at The Gallery and the Stable Bend Terrace this April. The Gallery’s view of the home straight is as wonderful as the revitalising food and invigorating wines and cocktails it serves. At the Stable Bend Terrace, you can cheer for your favourites as they pass the winning post while enjoying the evening air with al fresco dining and delicious BBQ. Capture your evening at The Gallery’s thematic photo spot. To round off your experience and let your intellect bloom as you ponder the questions in our Racing Trivia Game. Searched for a winning formula but failed to find the prize? Don’t worry, you can put all your eggs in one basket and get the help you need from our Racing Specialists, who can be found in The Gallery, Stable Bend Terrace and Bar Corner on the first floor of Beer Garden. Their knowledge and your passion for racing will be a match made in heaven. Reserve your spot for April 17th at http://bookingrc.hkjc.com. Use the promotional code [GA1813] for The Gallery and [SBT1805] for the Stable Bend Terrace and the Easter bunny will have a special gift¹ for each member of your party. Don’t wait - rise up and book now for a Happy Easter in the Valley. 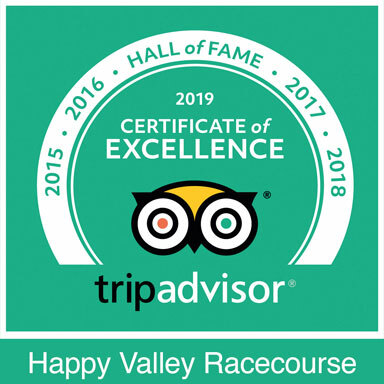 ¹ Racing 101 is available every Happy Valley race night. Each participant in this 50-minute programme receives a horse plush upon participation in racing. ² Gift is available on a first-come, first-served basis while quantities last.